Stayjax Seat Mats are made from 6P-Free closed-cell PVC to create a highly durable mat that protects your seats and cushion your dog’s claws. The raised bump pattern makes for a gripped surface maximizing your dog’s stability while remaining staying soft to the touch. Stayjax Seat Mats are handmade in Los Angeles with a focus on functionality, design and craftsmanship. Stayjax is easy to clean, needing only to be wiped down with a damp cloth, and is extremely portable with an average installation time of less than 30 seconds. 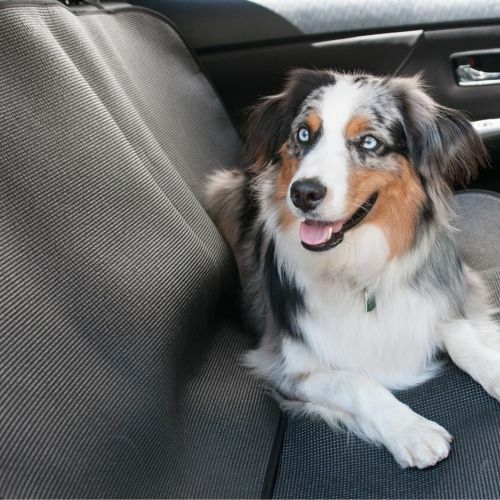 Stayjax Backseat Tops are made with two adjustable elastic straps to adjust the height of the seat and the ability to tuck underneath or over the bottom seat cushion. Keep your car clean, keep your pet safe and keep yourself happy. *This purchase is for the top portion only. If you would like the set, please add the Back Seat Set to your cart.